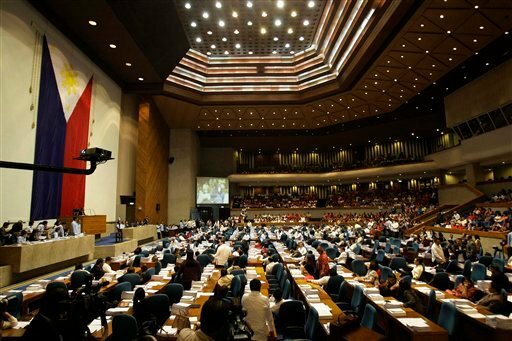 MANILA, Philippines—The House of Representatives approved on second reading the proposed P2.606 trillion national budget for 2015. The second reading passage ends the period of plenary deliberations and amendments as the budget bill moves on to the third and final reading in the lower chamber. After third reading, the bill will move on to the approval of the bicameral conference committee composed of both Houses of Congress, which will consolidate its two versions of the budget. The bill will then be transmitted to the President for final approval. The proposed 2015 budget is 15.1 percent higher than the approved 2014 budget worth P2.265 trillion. According to sectors, social services will receive the lion’s share at P967.852 billion or 37.14 percent of the total budget, followed by economic services at P700.198 billion or 26.87 percent share, general public services at P423.057 billion or 16.23 percent share, debt burden at P399.363 billion or 15.33 percent share, and defense at P115.530 billion or 4.43 percent share. Meanwhile, by agencies, the Department of Education will receive the highest budget at P365 billion, followed by the Department of Public Works and Highways at P300.5 billion, Department of National Defense at P144 billion, Department of the Interior and Local Government at P141.1 billion, Department of Social Welfare and Development at P109 billion, Department of Health at P102.2 billion, Department of Agriculture at P88.8 billion, Department of Transportation and Communications at P59.5 billion, Department of Environment and Natural Resources at P21.3 billion, and the judiciary at P20.3 billion.